Agriculture and animal husbandry started in the Near East region at about 12 000 years ago. The wild animals were domesticated: mouflons became sheep, aurochs became cows and bulls, and the wild boars became pigs. The firs cultivated plants were wheat and barley. At the same time, the first larger population centers started to form in the Fertile Crescent region, which located in the areas of currant Turkey, Lebanon, Palestine, Jordan, Israel and Syria. 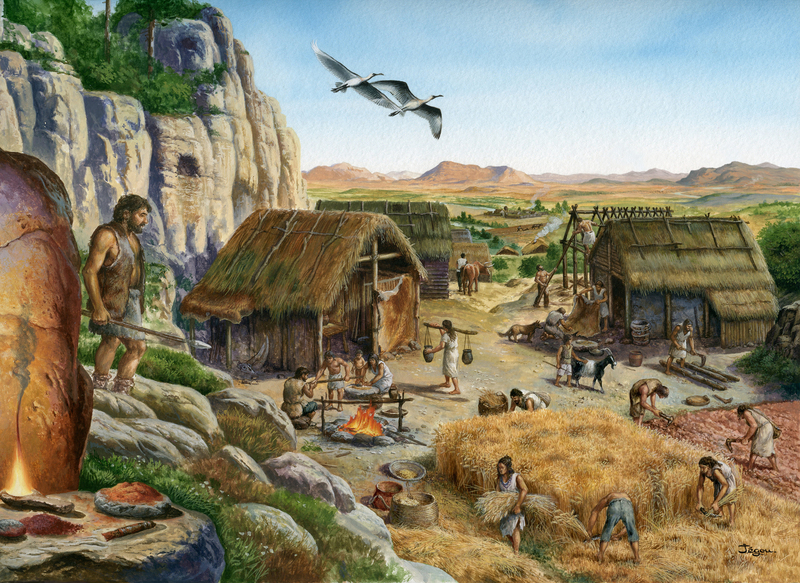 The oldest know town is the Catal Hüyük, founded about 8000 years ago, and locating in Anatoli, Turkey. At its most, about 5000 people lived in this town. The first irrigation systems were taken in use at about 7000 years ago, and this strongly promoted the agriculture.